Free glass of house wine (red or white) with purchase of any main course if you show your ticket to event in Vicar St on the same night! 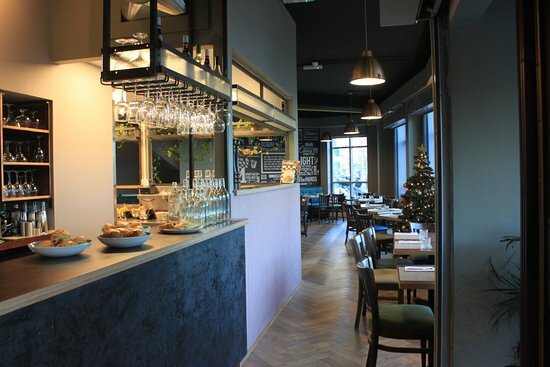 The Riddler is a contemporary yet cosy bistro, cafe and winebar located centrally in Dublin's Gothic Quarter in close proximity to popular tourist sites such as Christchurch, St Patrick's Cathedral, Trinity College, Dvblinia and Vicar Street. Serving delicious hearty food with an element of our wee city thrown in, our local staff will be thrilled to make your dining experience a memorable one. Food was excellent and very friendly staff. We popped in on Thursday 31Jan after seeing Trip Advisor comments. The steak and Monkfish were both outstanding. Staff attentive and professional. It was great to see the Chef and team “on stage” The following night we went to another restaurant which again in Trip Advisor had fantastic reviews..... we were so disappointed with it we booked a return visit to the Riddler and again suberb! I shall be adding a review to Trip Advuser this restaurant was the best eatery I’ve eaten in in a long time. Attentive staff but not intrusive. Very tasty food. delicious cocktails . Well worth a visit, will definitely return. Perfect spot befor Vicar St.
Great food!! Seafood linguini was excellent!! First time here and will definitely be back - gorgeous! Great restaurant particularly if you're going to a gig in Vicar St.
Food is delicious - I had the pre-theatre menu - seafood chowder for starters and chicken for mains with a side portion of chips - chowder was full of flavour,  so tasty on a cold winter evening - chicken dish was yummy - presented lovely too. Chips homemade with skins on - gorgeous. Fabulous meal. We requested a table not by the door and that's exactly what we were given despite there having been plenty of other available tables. The chowder was measley, lacking flavour and a bit cold. The staff were very slow to clear away our dishes after we finished the starters, at least 10 mins. No soap in the bathrooms. The table beside us received their meals before us despite having arrived after us! The food was lovely as always but during busy periods - like before a show in nearby venues - it would be good to have one more person on the floor. Was not made aware of offer of wine with main course as we were attending show in Vicar Street.That would have been nice instead of paying for the wine I ordered. Also on giving menus it would have been helpful to be informed of what the soup of the day was and when my partner was ordering his meal he was told that both the starter and main course he wanted were unavailable. This should have been explained before we ordered, instead of the waitress telling us cod was the same as hake?Food was very nice, I cannot fault what was served, just the manner of service could be improved. Excellent food. Very attentive and friendly staff. Would highly recommend and will visit again if I return to Dublin. Lovely spot, delicious food, cool atmosphere & great value on the early bird! I was delayed with traffic for my reservation and staff were really understanding and accommodating. Ideal place for an enjoyable meal before vicar street show and the free wine was a great bonus! Would recommend the rump of beef and the take. Wir waren 6 Personen und gaben kurzfristig einen Tisch reserviert. Vom Temple Bar district Fußläufig gut erreichbar. Sehr freundlicher Service und mein absolutes favorit, die offene Küche! Preis/Leistung Top für Essen und Getränke. Wir hatten einen super Abend! Great service and food. Will definitely be back. We found The Riddler via a tourism leaflet on a short trip to Dublin and thought it looked interesting enough to give it a go. Thoroughly enjoyed our evening. Creative and varied menu. Delicious food. Excellent service. All in a relaxing contemporary setting. Totally recomment. Excellent new find in Dublin City Centre - will be back! Nice place to eat, good food, a little noisy and not so private. Loved the riddles on the wall! Noisy restaurant where the sound of the coffee machine would drown out your conversation. No background music. Atmosphere was of confusion. Food brought to wrong tables (we were offered our neighbours starter), drinks lined on the counter but staff confused about which table they were to go to, resulting in long waits to get the staffs attention. Very young staff which gave off an air of inexperience. The food was ok but nothing to write home about. Menu was small so I would have thought they would be able to do their few dishes really well, it was just ok.